Origami is the Japanese art of paper folding that does not require cutting to turn a single sheet of (normally) square paper into a bird, an animal, a flower or something else. The term is a combination of ori (folding) and kami or gami (paper). Although the origin of origami is underdetermined, the technique of making paper came to Japan from China early in the seventh century. The Japanese took the art of making paper through a different technique, with different processing methods and raw materials Washi, a distinct and unique type of Japanese paper became very suitable to Japanese cultural creativity, which included origami. In its beginning, origami that turned out concrete shapes such as boats or cranes were considered as origami created as an expression of pure enjoyment. These first forms made an initial appearance during the Edo Period, which started in 1600 and lasted until 1868. It was also the time that low-priced, mass produced paper became available. The paper folding art became a tool for teaching during the Meiji Period from 1868 to 1912 for kindergarten and elementary school. During this period the Japanese origami was heavily influenced by Friedrich Wilhelm Fröbel, the originator of the kindergarten. Friedrich Fröbel borrowed the technique, using paper folding, weaving and binding as teaching tools for early child development in kindergarten schools. The Japanese are known for their love and understanding of nature, which they normally incorporate in their cultural art, such as the exquisite, minimalist style of flower arrangement they have developed, the Ikebana. That is why initially, origami designs were of boats, birds, animals and flowers, which they created in simple easy steps for children to follow, to more advanced designs with more intricate and complex folding required. 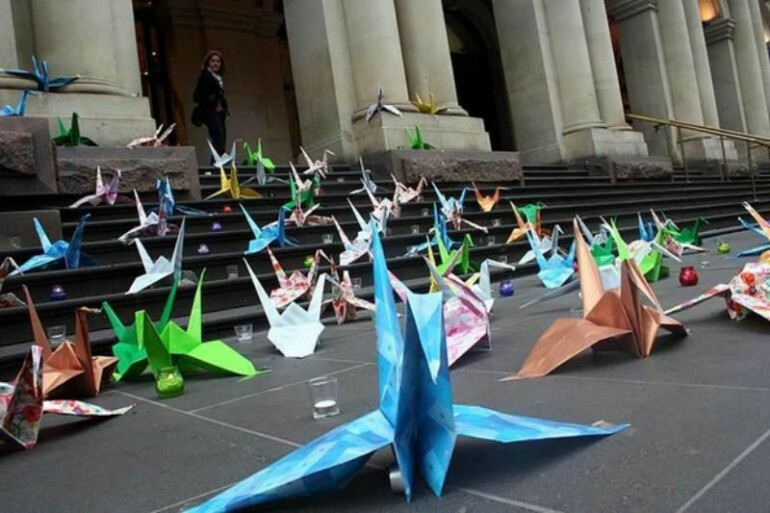 Stories about origami were also integrated into Japanese culture, where stories such as a paper bird turning into a real one are told and retold. Modern interest in origami came about in 1954. Grandmaster origami artist Akira Yoshizawa at that time made notations on how to fold the origami models in his first monograph entitled Atarashii Origami Geijutsu or New Origami Art. The Yoshizawa-Randlett notation system using diagrams, arrows and symbols to make origami folds easier to follow was established. It later became the standard in paper-folding books. In 1954, Yoshizawa founded the International Origami Center located in Tokyo. Today, paper folding artists have taken the traditional art form to new heights. Using the same paper folding techniques of origami, they are creating bigger and more complex sculptures out of a single sheet of paper. The father of minimalistic art and modern color theory, Josef Albers, taught paper folding and origami from the 1920s and the 1930s in the highly-regarded Bauhaus design school in Germany. 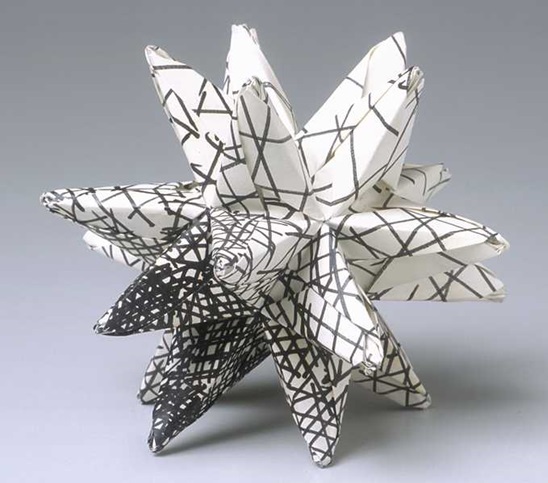 He used round papers that were formed and folded into round shapes and spirals, which influenced Kunihiko Kasahara, another Japanese origami artist. Akira Yoshizawa also invented the techniques and process of wet-folding which involved dampening the paper slightly during the folding process, which helped the product to better hold and retain its shape. More variations of the traditional style include modular origami, whereby several origami units were created and later assembled to create one whole decorative piece. Origami has taken off from being made from small square pieces of paper. It is used to create monumental sculptures, that are used as art installations, advertising, print, film and animation project. Some were also cast in bronze to make them permanent. Robert J. Lang, an American physicist, is also a pioneer in the different approach to origami art. He has created more than 480 original large scale origami compositions. Sipho Mabona, an origami master from Switzerland raised funds through Indiegogo to have a special 2,500 square foot sheet of paper produced. With the $26,775 he was able to raise (target $24,000) he made good his promise to fold a life-sized elephant for the Swiss Art Museum located in Beromünster. He also planned to film its creation in time-lapse video. The piece, which is now on display at the art museum is entitled White Elephant. The artist is also the creator of the famous swallows and koi origami works.